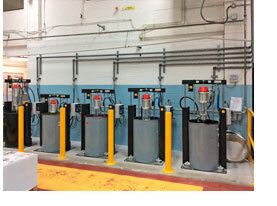 Taylor Bloxham installs a Samoa Hydrair centralized automatic ink pumping system. Taylor Bloxham Group, one of the largest independent lithographic printers in the UK, has recently started-up a new Heidelberg Speedmaster XL 105 with 12 units. The new centralized ink pumping system has also been part of the 4 mill GBP spend. Taylor Bloxham trusted Samoa Hydrair, the clear leader of the British market since more than 50 years. Samoa Hydrair installed 5 ink pumping assemblies, formed by one twin post ram designed to empty 200 kg standard drums and one heavy-duty piston pump Dreadnought Series, with a 6” air motor and a pressure ratio of 22:1. 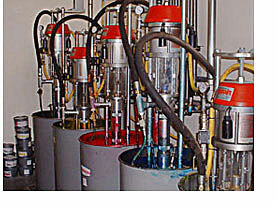 Four ink pumping assemblies will be used for CMYK colours and the fifth unit for varnish supply. In order to maintain the ink level in each ink duct, Samoa Hydrair installed automatic ink spreader bars on 14 ink ducts. 10 units for the new Speedmaster XL 105 and 4 units in another existing Heidelberg Speedmaster XL, which had an ink cartridge system. The installation of an automatic ink levelling and the change from cartridges or cans for 200 kg ink drums, represents an improvement in terms of modernity, efficieny, cleanliness and convenience for the operators. Furthermore, the ink price saving, the wasted ink reduction and the waste disposal makes the investment easily returnable in a very short-term. The sheetfed printers are increasingly convinced that the advantages of the ink supply systems are very convenient for their printing sites. Samoa Hydrair has the widest range of ink pumps and ancillary equipment, therefore is able to propose the best solution in order to meet the most demanding requirements of all kind of printers, from the smallest sheetfed printer up to the biggest newspaper printer of the world. 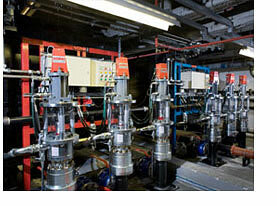 Polestar group starts-up the Samoa-Hydrair automatic ink pumping system. Polestar Group, one of the biggest commercial printers in the world, has just started up the two first Goss Sunday 5000 web-offset presses at the new printing site extension in SHEFFIELD, UK. 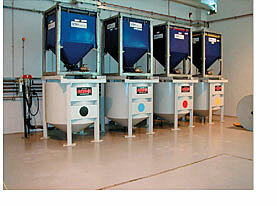 The complete ink supply system was designed, manufactured and installed by Hydrair Ltd., part of the Spanish Samoa Group since 2006. The centralized ink pumping system has been designed to feed not only the two existing printing presses, but also further presses which will be added in the coming months as part of this significant investment done by Polestar Group. The installation carried out by Samoa Hydrair, one of the most important in its over 50 years history, includes eight heat-traced tanks with a capacity of 20.000 l each, connected to sixteen heavy-duty Chieftain Series pneumatic piston pumps, the biggest ink pumps in the world, with 16” air motors, a pressure ratio of 23:1 and more than 1 kg of ink delivery per stroke. Each of the impressive Chieftain pumps weights more than 350 kg and has a height of over 1,7 meters. 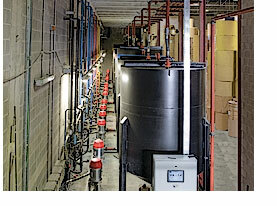 Furthermore, the Samoa Hydrair engineers carried out the turn-key project including more than 80 length of 3” pipe work at over 15 meters high up to the two running Goss Sunday presses, as well as the complete electronic ink control system installation (ink tanks level, ink consumption control, warning alarms,…). Newspapers printed: The Sun, The Times, The Daily Telegraph, The Sunday Telegraph, The Financial Times. 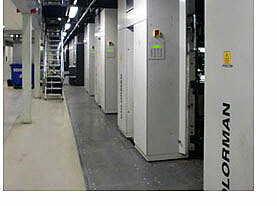 Presslines: two ManRoland Colorman XXL presslines. 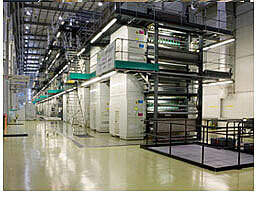 Each press-line with ten folders, fifty towers (four high), and one hundred ducts per colour. Twenty-six Chieftain pumps with hydraulic motor and control system, each pump equivalent to a 16” air operated pump with a 23:1 pressure ratio. 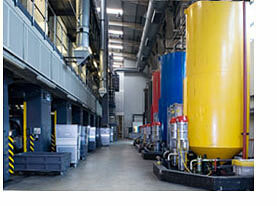 One of the largest automatic ink supply systems in the world! Newspapers printed: The Sun, The News of the World, The Times, The Sunday Times, The Daily Telegraph, The Sunday Telegraph, The Financial Times. 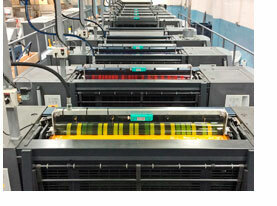 Pressline: ManRoland twenty-five towers, six folders. Main pump room: thirteen Chieftain pumps with hydraulic motor and control system, each pump equivalent to a 16” air operated pump with a 23:1 pressure ratio. 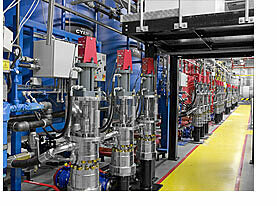 Transfer pump room: two pneumatic pumps with 10” air motors and a 3:1 pressure ratio. Newspapers printed: The Sun, The Times, The Daily Telegraph, Edinburgh Evening News, The Guardian. 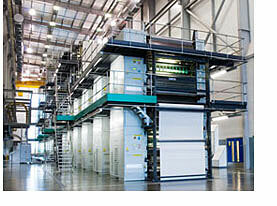 Pressline: ManRoland, twelve towers, two folders. Eight Chieftain pumps with hydraulic motor and control system, each pump equivalent to a 16” air operated pump with a 23:1 pressure ratio. Newspapers printed: The Daily Mirror, The Sunday Mirror, The Independent, The Daily Record, The Racing Post. Thirteen Chieftain pneumatic pumps, with 16” air motors and 23:1 pressure ratio. Eight Dominator pneumatic pumps, with 10” air motors, and 16:1 pressure ratio. 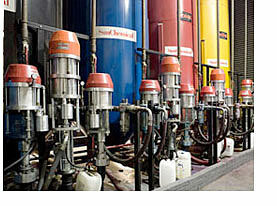 Ink supply control system, filters, pressure regulators, flow meters, tank load cells. 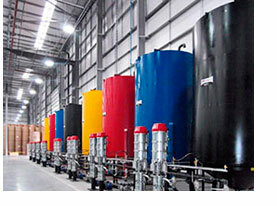 Ten bulk ink storage tanks (four 15,000 kg black ink tanks, and two 10,000kg tanks for each of the three colour inks), bulk ink tank offset fill station, pipework and pump manifolds. Newspapers printed: The Guardian, The Guardian Weekly, The Observer. Ten Commander pneumatic pumps, with 14”air motors and 17:1 pressure ratio. 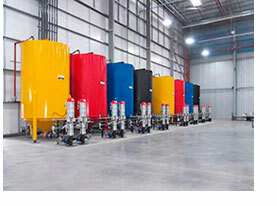 Five bulk ink storage tanks (two 10,000 kg black ink tanks, and one 10,000kg tank for each of the three colour inks), bulk ink tank offset fill station, pipework and pump manifolds. Newspapers printed: Daily Mirror, The Sunday Mirror, The Sunday People, The Birminghan Post. Other media printed: sales flyers for Tescos, Morrisons etc. 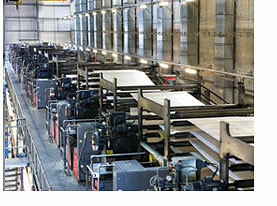 Pressline: Goss, twelve towers, four folders, double width. Eight Titan pneumatic pumps, with 12” air motors and 12:1 pressure ratio. 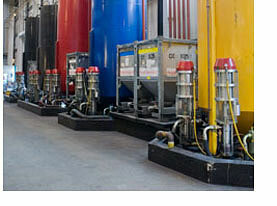 Eight bulk ink storage tanks (two 15,000 kg black ink tanks, and two 10,000kg tanks for each of the three colour inks), bulk ink tank offset fill station, pipework and pump manifolds. Media printed: magazines such as Radio Times, TV Times, Woman, Soaplife, Woman’s Own, catalogues and newspaper supplements. 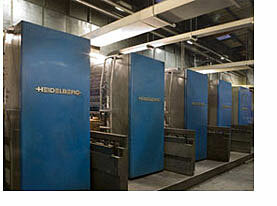 Presslines: eight Heidelberg and Man Roland presslines. Pump room one: eight Dominator pneumatic pumps, with 10” air motors and, for special inks, four Warrior pneumatic pumps with 8” air motors. Pump room two: eight Commander pneumatic pumps with 14” air motors. 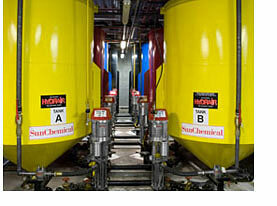 Four 10,500kg and four 7,500kg bulk ink storage tanks, pipework and pump manifolds. 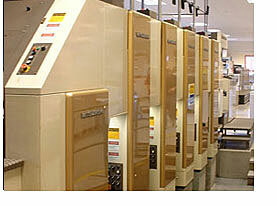 Media printed: magazines, catalogues, newspaper supplements and books. Presses: three Mitsubishi sheet fed presses. Five Warrior pneumatic pumps with 8” air motors and 22:1 pressure ratio. All pumps mounted on 200kg drum single post rams (pump lift and inductor). 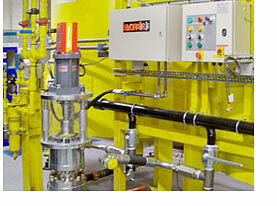 Ink supply control system, alarms, spreader bars, sensors, pipework and pump manifolds. Media printed: magazines, catalogues and newspapers supplements. Presses: five in total, ManRoland and Heidelberg. Four Commander pneumatic pumps with 14” air motors and 17:1 pressure ratio. Eight Dominator pneumatic pumps with 10” air motors and 16:1 pressure ratio. 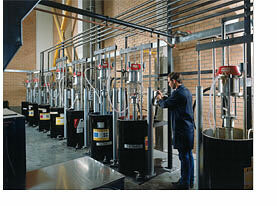 Ink supply control system, filters, pressure regulators, flow meters. 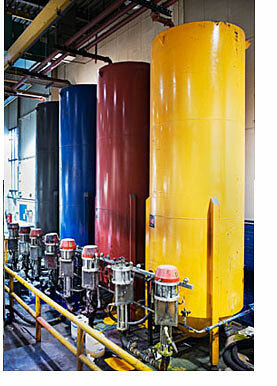 Eight 7,000kg bulk ink storage tanks, bulk ink tank offset fill station, pipework and pump manifolds. 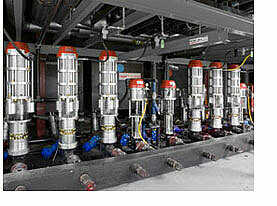 Eight Warrior pneumatic pumps with 8” air motors. All pumps mounted on 200kg drum twin post rams (pump lift and inductor). Ink supply control system including drum empty alarms and automatic pump shut-off on drum empty. Four Warrior pneumatic pumps with 8” air motors. Ink supply control system including tank low level alarms and automatic pump shut-off on tank empty. Four 1,500 litre mother-daughter tank systems. 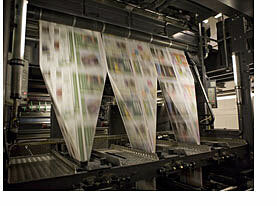 Media printed: magazines, promotional catalogues of supermarkets and other distributors. Some magazines: Interviu, Vogue, Pronto, Lecturas, Mia, Traveler, Cuore, Caza, Pesca, Autopista, Tiempo, Inversión, Cocina Ligera, Vanity Fair, El dominical de El Mundo. . .
Commercial brochures: El Corte Inglés, Hipercor, Media Mark, Dia, Carrefour, Makro, Lidl. . .
Presses: 8 in total, ManRoland, Goss y Heidelberg. 16 Titan pneumatic pumps of 12”, 23:1 pressure ratio. Stroke counter incorporated, preventive maintenance centralized program. Installation centralized control, cabinet with touch screen, telemetry, end user and ink supplier management software, manifolds, ink filters, pilot valves, electro valves. 8 storage tanks, 2 with 20.000 kg, 2 with 18.000 kg, 1 with 16.000 kg and 3 with 14.000 kg. Tank contents control and management software. 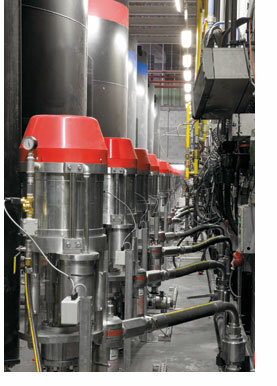 Off-set fill cabinets, tank fill pipes, supply manifolds to pumps, ink distribution pipes up to web offset presses, inner ink circulation bars, pumps.